Periodic Table is the tabular arrangement of all the chemical elements which are organized based on atomic numbers, electronic configurations and existing chemical properties. 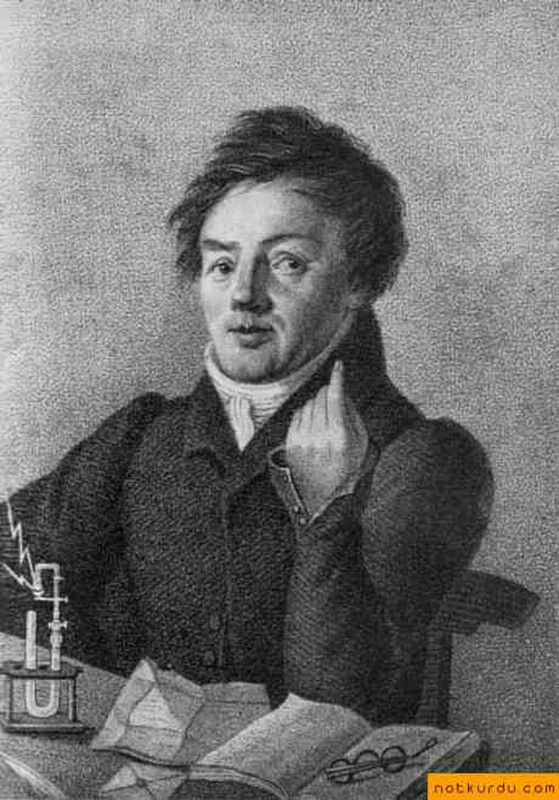 Johann Wolfgang Dobereiner classified the elements in groups of 3 called triads. 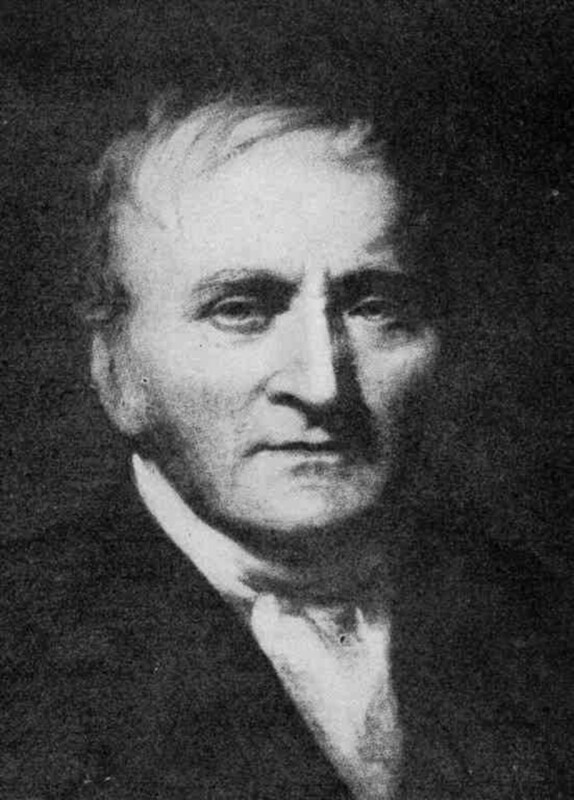 John A. Newlands arranged the elements in the order of increasing atomic mass. 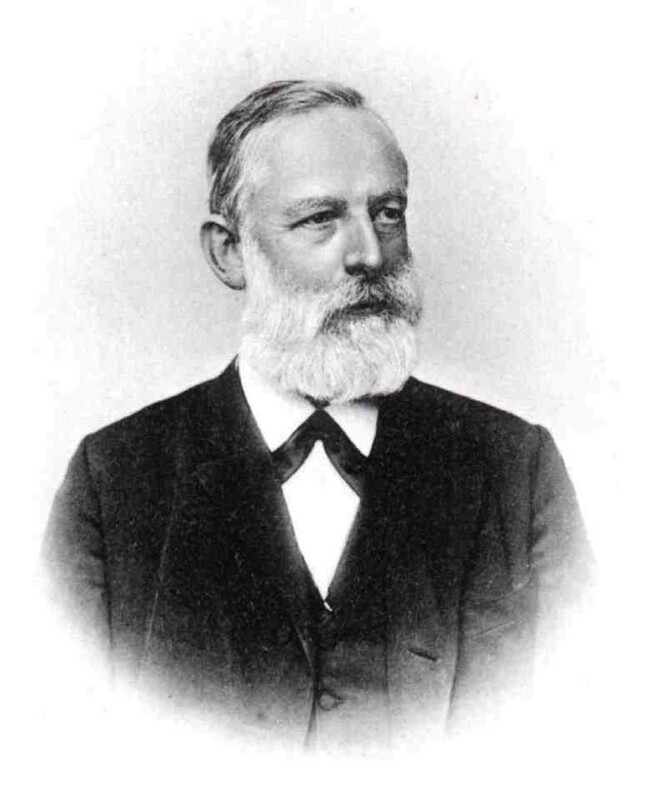 Lothar Meyerplotted a graph showing an attempt to group elements according to atomic weight. Dmitri Mendeleev arranged in the order of increasing atomic weights with a regular repetition (periodicity) of physical and chemical properties. Henry Moseley is known for the Modern Periodic Law. As early as 1800, chemists began to determine the atomic weights of some elements with fair accuracy. Several attempts were made to classify the elements on this basis. He classified the elements in groups of 3 called triads, based on similarities in properties and that the atomic mass of the middle member of the triad was approximately the average of the atomic masses of the lightest elements. He arranged the elements in the order of increasing atomic mass. The eight elements starting from a given one is a kind of repetition of the first like the eight notes of the octave of music and called it the law of octaves. He plotted a graph showing an attempt to group elements according to atomic weight. He worked out a Periodic Table of Elements were the elements were arranged in the order of increasing atomic weights with a regular repetition (periodicity) of physical and chemical properties. He arranged the elements in the order of increasing atomic numbers, which relates that the properties of the elements are periodic functions of their atomic numbers. This is known as the Modern Periodic Law. What are periods, groups and families? Period 1 has 2 elements corresponding to 2 electrons in the s sublevel. Periods 2 and 3 have 8 elements corresponding to 8 sublevel electrons in the s and p sublevels. Periods 4 and 5 have 18 elements corresponding to 18 electrons in the s,p and d sublevels. Periods 6 and 7 also include the 14 f electrons but the seventh period is incomplete. 1. Representative Elements are the elements in A Group/ Family. The term representative element is related to stepwise addition of electrons to the s and p sub levels of the atoms. Elements belonging to the same group or family have similar properties. 2. Noble Gases or Inert Gases are the elements in the last group with completely filled set of s and p orbitals. 3. Transition Elements are the elements in the columns IB - VIIIB which are called the B Group/Family. Take note that they start with IIB up to VIIB, which have 3 columns and then end with IB and IIB. These sequences, which contain 10 elements each, are related to the stepwise addition of the 10 electrons to the d sub level of the atoms. These elements are metallic-dense, lustrous, good conductor of heat and electricity and in the most cases are hard. They form the many colored compounds and form polyatomic ions like Mn04 and CrO4. 4. 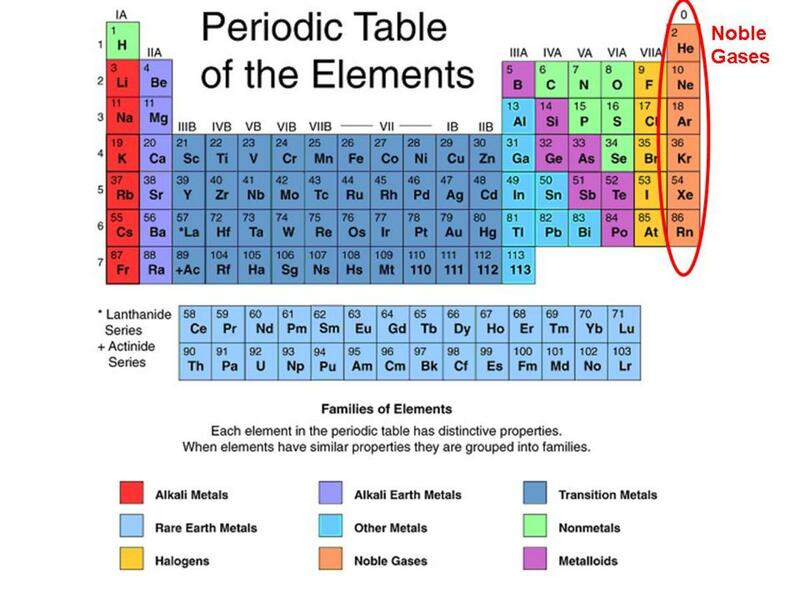 Inner Transition Elements are the 2 additional horizontal rows below composed of 2 groups of elements which were discovered to have similar characteristics as Lanthanum in the 6th period called Lathanoids (Rare Earth Metals) and Actinium (Heavy Rare Elements). The Lanthanoids are all metals while the Actinoids are all radioactive. All the elements after Uranium are produced artificially by nuclear reactions. The ground state electronic configuration of the element is related to their positions in the Modern Periodic Table. Elements within any group exhibit a characteristic valence. The alkali metals of group IA exhibit a valence of +1, since the atoms easily lose the one electron in the outer level. The halogen of Group VIIA has a valence of -1, since one electron is readily taken up. In general, atoms, which have less than 4 valence electron, tend to give up electron thus having a positive valence corresponding to the number of electrons lost. While atoms with more than 4 valence corresponding to the number of electrons gained. Oxygen has 6 valence electron thus it will gain 2 electrons -2 valence Group VIIIA has a stable outer configuration of electrons (with 8 valence electrons) and would not be expected to give up or take up electrons. Thus, this group has a zero valence. In the B series, the incomplete level contributes to valence characteristics. One or two electrons from an incomplete inner level may be lost in chemical change and added to one or two electrons in the outer level, which allows possibilities of valence among the transition elements. Iron may exhibit valence of +2 by loss of the 2 outer electrons or a valence of +3 when additional electron is lost from the incomplete 3rd level. The kernel notation or electron dot notation is used to show the valence electrons in the atoms. The symbol of the elements is used to represent the nucleus and all inner electrons and dots are used for each of the valence electron. Metals are at the left and in the center of the Periodic Table. About 80 elements are classified as metals including some form in every group except Groups VIIA and VIIIA. The atoms of metals tend to donate electrons. Nonmetals are at the far right and toward the top of the Periodic Table. They are composed of about a dozen relatively common and important elements with the exception of Hydrogen. Atoms of non-metals tend to accept electrons. Metalloids or borderline elements are elements that to some extent exhibit both metallic and nonmetallic properties. They usually act as electron donor with metals and electron acceptor with non-metals. These elements lie in the zigzag line in the Periodic Table. 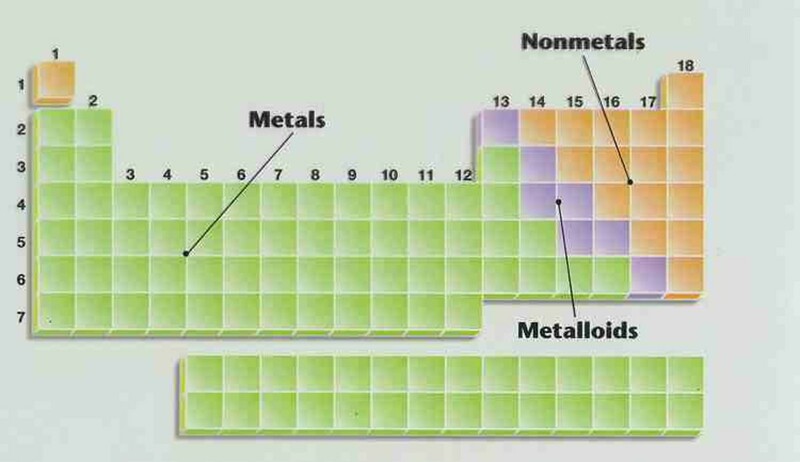 Metals, nonmetals and metalloids are neatly arranged in the Periodic Table. The atomic radius is approximately the distance of the outermost region of electron charge density in an atom drops off with increasing distance from the nucleus and approaches zero at a large distance. Therefore, there is no sharply defined boundary to determine the size of an isolated atom. The electron probability distribution is affected by neighboring atoms, hence, the size of an atom may change from one condition to another as in the formation of compounds, under different conditions. The size of the atomic radius is determined on covalently bonded particles of elements as they exist in nature or are in covalently bonded compounds. 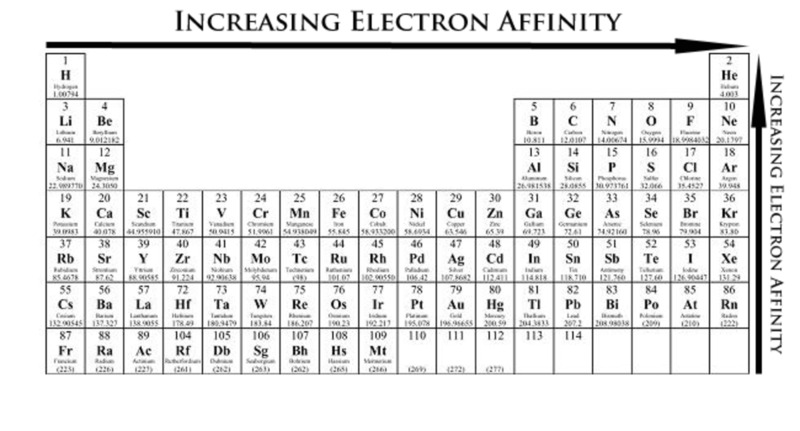 Going across any period in the Periodic Table, there is a decrease in the size of the atomic radius. Going from left to right, the valence electron are all in the same energy level or the same general distance from the nucleus and that their nuclear charge increased by one. Nuclear charge is the force of attraction being offered by the nucleus towards electrons. Therefore, the greater the number of protons, the greater is the nuclear charge and the greater is the over pull of the nucleaus on the electron. Although the number of protons from top to bottom within the same group increases, the atomic size still increases due to the additional energy level as seen from the above illustration. Therefore, atomic size increases from top to bottom within the same group. Atoms get smaller from left to right in a period. 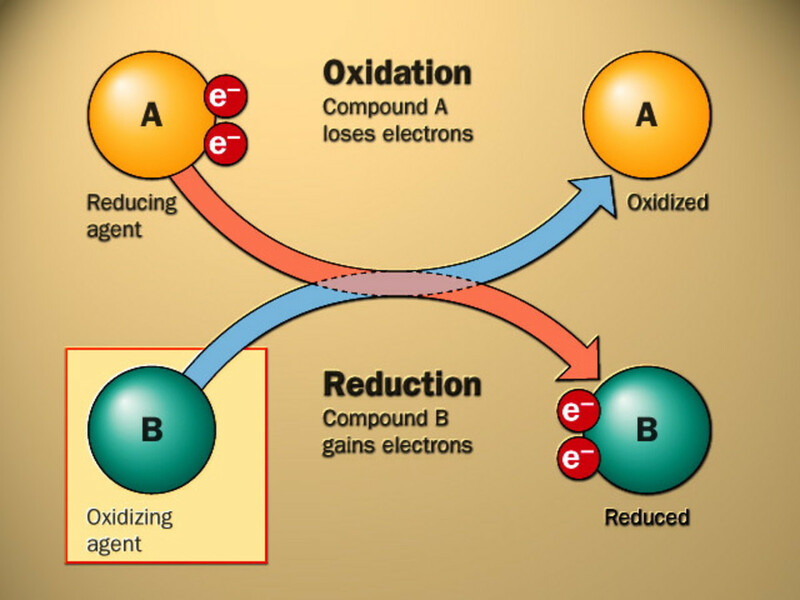 When an atom losses or gains electron, it becomes a positively/negatively charge particle called ion. Magnesium losses 2 electrons and becomes Mg+2 ion. Oxygen gains 2 electrons and becomes 0-2 ion. The loss of electrons by a metal atom results in a relatively large decrease in size, the radius of the ion formed is smaller than the radius of the atom from which it was formed. For nonmetals, when electrons are gained to form negative ions, there is a rather large increase in the size due to the repulsion of the electrons for one another. Cation and anion increase in size as you go down a group in a Periodic Table. Ionization energy is the amount of energy required to remove the most loosely bound electron in a gaseous atom or ion to give a positive (+) particle of cation. The first ionization energy of an atom is the amount of energy required to remove the first valence electron from that atom. The second ionization energy of an atom is the amount of energy required to remove the second valence electron from the ion and so forth. 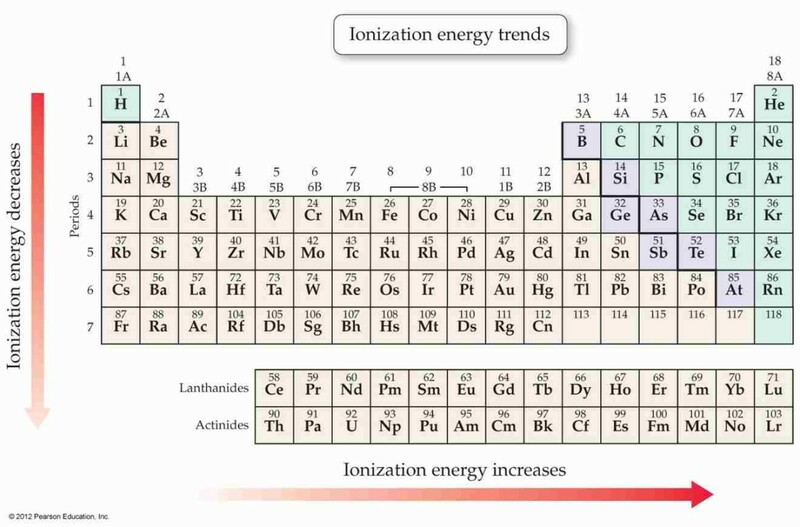 The second ionization energy is always higher than the first, since an electron is removed from a positive ion, and the third is likewise higher than the second. Going across a period, there is an increase in the ionization energy due to the removal of electron in each case is at the same level and there is a greater nuclear charge holding the electron. The charge of the atomic nucleus for atoms of similar electronic arrangement. The greater the nuclear charge, the greater the ionization potential. The shielding effect of inner electrons. The greater the shielding effect, the smaller the ionization potential. The atomic radius. As the atomic size decreases in atoms with the same number of energy levels, the ionization potential increases. The extent which the most loosely bound electron penetrates the cloud of inner electrons. The degree of penetration of electrons in a given main energy level decreases in the order of s>p>d>f. All other factors being equal, as in the given atom, it is harder to remove an (s) electron than a (p) electron, a p electron is harder than a (d) electron, and d electron is harder than an (f) electron. Attractive force between the outer level electrons and the nucleus increases in proportion to the positive charge on the nucleus and decreases with respect to the distance separating the oppositely charged bodies. Outer electrons are not only attracted by the positive nucleus but are also repelled by electrons in the lower energy levels and their own level. This repulsion, which has the net result of reducing the affective nuclear charge, is called the shielding effect or screening effect. Since from top to bottom, ionization energy decreases in A family, the screening effect and distance factors must outweigh the importance of the increased charge of the nucleus. Electron affinity is the energy given off when a neutral gaseous atom or ion takes in an electron. Negative ions or anions are formed. Determining electron affinities is a hard task; only those for the most nonmetallic elements have been evaluated. A second electron affinity values would involve gain and not loss of energy. An electron added to a negative ion would result in Coulombic repulsion. This periodic trends of electron affinity, of the strongest nonmetals, the halogens, are due to their electron configuration, ns2 np5 that lack a p orbital to have stable gas configuration. Nonmetals tend to gain electrons to form negative ions than metals. Group VIIA has the highest electron affinity since only one electron is needed to complete a stable outer configuration of 8 electrons. Electronegativity is the tendency of an atom to attract shared electrons to itself when it forms a chemical bond with another atom. Ionization potential and electron affinities are regarded as more or less expressions of electronegativities. Atoms with small size, high ionization potential and high electron affinities would be expected to have high electronegativities Atoms with orbitals nearly filled with electrons will have higher expected electronegativities than atoms with orbitals having few electrons.Non metals have higher electronegativities than metals. Metals are more of electron donors and non metals are electron acceptors. 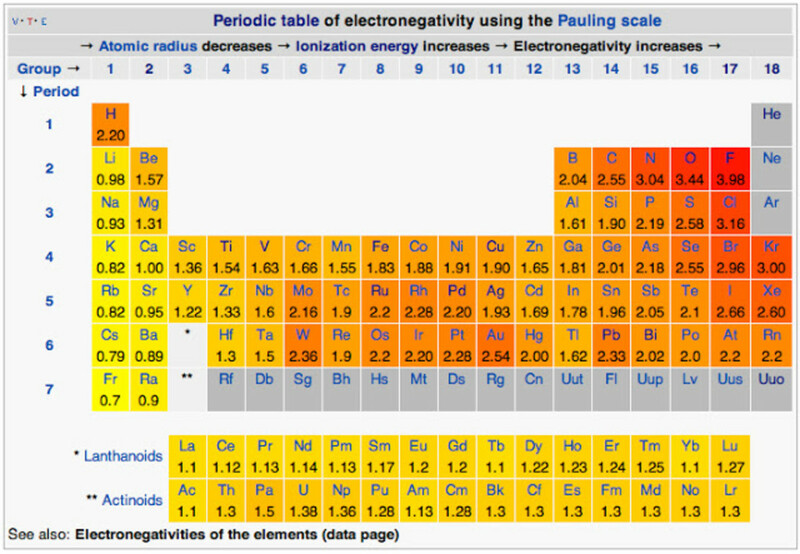 Electronegativity increases from left to right within a period and decreases from top to bottom within a group. Electronegativity increases from left to right within a period and decreases from top to bottom within a group. 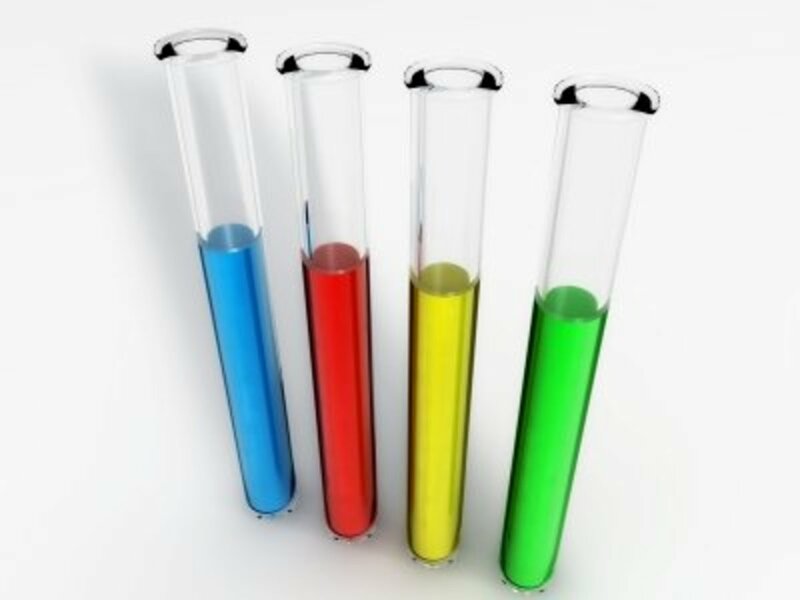 Learn about the periodic properties or trends in the periodic table of the elements. 1. The most metallic element. 2. The most nonmetallic element. 3. The element with the biggest atomic size. 4. The element/s classified as alkali metal/s. 5. The element/s classified as metalloids. 6. The element/s classified alkali-earth metals. 8. The element/s classified as halogens. 9. The lightest of the noble gas. 10. Element/s with electronic configuration/s ending in d.
11. Element/s with electronic configuration ending in f.
12. Element/s with two (2) valence electrons. 13. Element/s with six (6) valence electrons. 14. Element/s with eight (8) valence electrons. 15. Element/s with one main energy level. 1. State the Periodic Law. 2. Explain clearly what is meant by the statement that the maximum possible number of electrons in the outermost energy level is eight. 3. What are transition elements? How do you account for the marked differences in their properties? We can called the Periodic Table as the "key of life" because all the elements or compounds of the elements of on the periodic table make up the world. The periodic table of elements is a fabulous way to organize and understand elements that make up everything. Chemical reactions and elements affect the way we live. The periodic table is organized so people can understand the properties of certain elements. For this topic, we learned that the periodic table composed of different elements that is according to their atomic no., atomic mass even the protons, electrons, electronic configuration and atomic structure. As a Medtech student, we always deal with chemical elements. And as a medical student it is important for us to know what does that element composed of, how does it react with other elements, and what is the use of that element because in laboratory test, reagents are used to know the blood type of a person, is it positive or negative and also in testing BUN and Creatinine and other tests to identify what does our body lacks of or have an excess of. The periodic table is useful for modern students and scientist and especially for me (a medtech student). We should not forget what we had learned and we should be familiarized because we might use this in the near future. SAYCO. PATRICIA MAE M. BSMT1. Periodic table has big responsibility in our life including the different elements that discovered by the scientist. Our body needs different elements to survive like Oxygen, Hydrogen, Iron, Calcium and etc. and we release Carbon Dioxide when we breathe out. Periodic table is the most important tool in chemistry because of its function and also of having atomic properties that are useful for making a study in laboratory. -Periodic table of elements is very important because it gives us the informations we have to know. We have to familiarize ourselves as well with this elements for us to be able to know each. Periodic table of elements is a big help to us because the modern one is organized. As a medtech student, studying this should not be missed because more or less of these elements are related to our field. As a medtech student, knowing and studying of periodic table is very important to us because it can give us a background about elements that we will encounter. Periodic table is a tool where you can find and know the atomic number, atomic mass, groups and periods of an element. This lesson is big help for us. tudying about Periodic Table enables me to get more information about elements and its properties. Even the classifications of elements. The elements that are considered as metals, nonmetals, and metalloids. I also learned about the elements that are considered as the most-metallic, most-nonmetallic, the different groups and periods, etc. CRISTOBAL, DARAH ARTHRIA DC. BSMT 1. Periodic table is organized like a big grid and each element is placed in a specific location because of its atomic structure. As with any grid, the periodic table has rows (Families or Periods) and columns (Group). Each row and column has specific characteristics. Having knowledge about the periodic table is really a huge thing in our future profession. By studying the periodic table, We can clearly identify information about the properties of each elements because elements are arranged by order of their atomic number. One of the most useful feature of the periodic table is it can provide all the information that we need during an experiment. Studying the periodic table of elements was kinda hard at first but when you dig deeper into it, you will appreciate its importance. The elements that are included in the periodic table was very essential to every medical student like me. Because as a future scientists, we will deal with different elements in the laboratory. So we should have a background and knowledge about its type and chemical reactions that are likely for an element. This information provided by Prof. Liwayway was very helpful for us to understand it clearly. Studying the periodic table with you Ma'am makes it a lot easier and fun because we're learning and at the same time we're laughing. And now I'm starting to love chemistry because of you ma'am. So learning the periodic table, groups, families, valance electron etc. etc. I realized that all of the scientist that work together to build those elements to arrange those elements in order, worked hard, for us the future Medical Technician to learn the importance of it. It's very important to learn the periodic table especially in our field but thanks to you prof! we are learning many things! Thank you! Knowledge about the Periodic Table, which gives us significant information about different elements, is very essential as a future Medical Technologist because in the future, we are going to deal with different kind of elements. Having knowledge about them will make it easier for us to understand them which is a huge factor in fulfilling the job that we will have in the future thus, emphasizing its relevance to our course. Knowledge about the periodic table of elements is important as a future medical technologist. Knowing the elements will help me understand them when we encounter them in the laboratory. Understanding the periodic table of elements is really relevant as a soon to be medical technologist. This knowledge will help us for our future career and will give us a brief background about the periodic table and every elements function on it. Reading this article reminds me that periodic table is important in our daily life by simply knowing what elements you are using and what are the properties it contains. To the given elements in the periodic table we can create and use that element in our daily life for our survival and other things. Studying the periodic table of elements is very much needed in a future Medical Technologist. It will gives us knowledge about different elements that we will encounter in many labaratory experiments. Knowing the elements, its atomic mass, atomic number, electron, proton, neutron, valence, electronic configuration, groups and period will be a very big help to us to know their structures. This lesson is very relevant to my course which is Medical Technology. Having knowledge about the periodic table is one of the interesting thing that you'll have. It involves what are the element/s that has high electron negativity, low electron negativity, high electron affinity, and high ionization potential. You can also learned what is the most metallic element and most non metallic element, halogens over noble gases. With the help of Periodic Table of elements , the Atomic number is arranged increasingly which helps us to easily trace the elements. As a future medical technologist, we need to know these things that can give us a brief background about the periodic table of elements. Periodic table is a master piece because of organized elements' information, they are arranged clearly by their atomic number. Without the periodic table of elements, each element will not be unique if they have the same atomic numbers. Knowing something about periodic table can give me a brief background about elements. In my future workplace, we need to deal as well with the 13 essential elements in our body and knowing something about those elements, we can apprehend more how it behaves thus, creating a more accurate understanding about those. As a future medical professional, dealing with these things is our nature and truly, learning something about periodic table is a great help. The periodic table is a tabular arrangement of the chemical elements, ordered by their atomic number, electron configuration, and recurring chemical properties, whose adopted structure shows periodic trends. 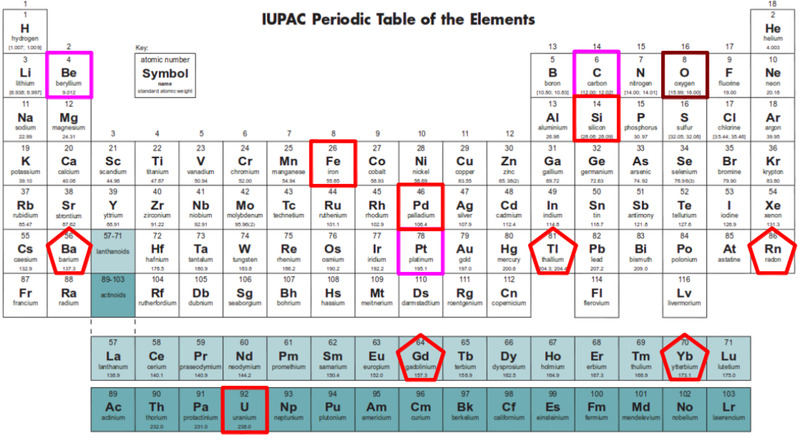 Generally, within one row (period) the elements are metals on the left, and non-metals on the right, with the elements having similar chemical behaviours being placed in the same column. Table rows are commonly called periods and columns are called groups. Six groups have accepted names as well as assigned numbers: for example, group 17 elements are halogens; and group 18 are noble gases. Also displayed are four simple rectangular areas or blocks associated with the filling of different atomic orbitals. the periodic table of the elements of the elements has gone through numerous revisions over the years as scientists have gained more knowledge about the atomic structure of the elements. The most recent version of the periodic table provides useful information that, directly or indirectly, affects everyone. some people didnt know the importance of this but, they should know about this. Periodic Table is important in chemistry because for studying elements in a systematic and standard manner. 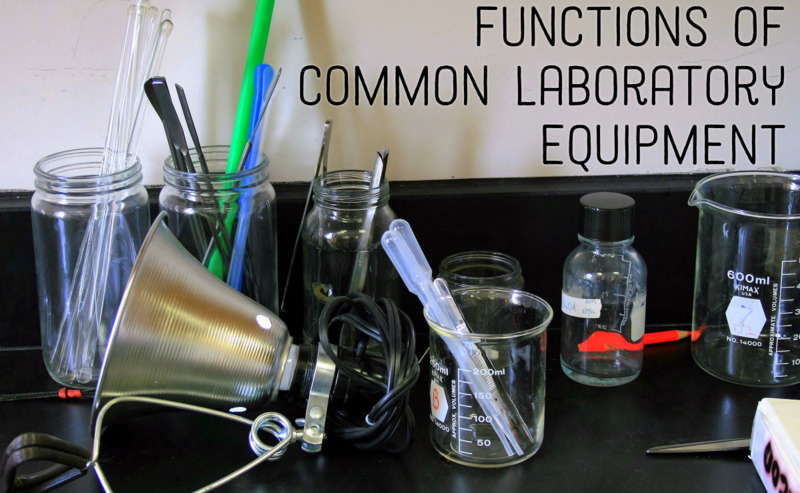 The periodic table organizes elements according to similar properties so you can tell the characteristics of an element just by looking at its position on the table and to distinguish what element we need to use in our lab. Periodic table is very relevance to hospitality Management because it will give us an edge to distinguished nonmetal to metal and also we can know what possible element we can use to give our job an extra level like liquid nitrogen now use in cooking so periodic table is relevant to us. The periodic table is a tabular arragement of the chemical elements, ordered bt their atomic number number (number of protons), electron configurations, and recurring chemical properties. The periodic table is organized like a guess in a hotel each elements is placed in a specific location or rooms because of its atomic structure. Each rows and column has specific characteristics like the different types of hotel rooms like single room,double room, queen bed etc. that may offer to the guest. Periodic table of elements are very important to us all bacause it can be use in all things. to know all the elements that is existing in the world. It is helpful for engineers to know what is the best element that they can use by using periodic table of elements. Periodic table is a table that show case of chemicals grouped together to understand its composition,and help us derive relationships between the elements. For me, as a Hospitality Management Student it is important for us to know the different elements and and we can predict the types of chemical reactions that are likely for an element. We can work safely if we know about those components of those materials so we can properly use the materials we needed in our course. 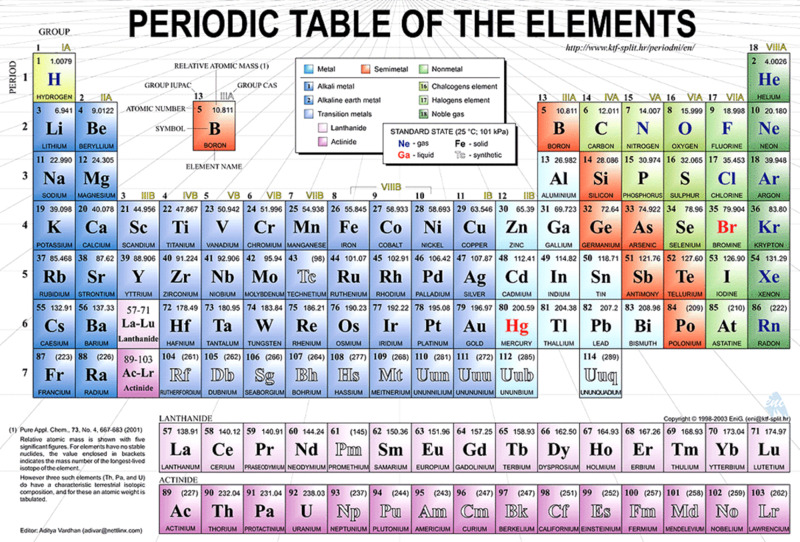 The periodic table organizeelement according to similar properties so you can tell the characteristics of an element just by looking at its position on the table. Those elements are important because we're surrounded by elements so that we need to know something behind of it. We need to know at least some of these especially the 13 elements in a human body; hydrogen, carbon, nitrogen, oxygen, sodium, magnesium, phosphorus, sulfur, chlorine, potassium, calcium, iron, iodine. the periodic table organizes elements to make nursing student easier to find. nurses might need them to know what drugs to use and students use them as a means of organization. its much easier to find the atomic mass of carbon by looking it up on the table as opposed to looking it up in a textbook. The Periodic Table is a tabular form wherein the elements are organized based on their atomic numbers and electron configuration. As a nursing student, it is important to know, memorize, and understand the 13 essential elements found in the Human Body- which are the carbon, hydrogen, oxygen, phosphorus, potassium, iodine, nitrogen, sulfur, calcium, iron, magnesium, sodium, and chlorine- in order for me to understand more how they function inside our body for us to become healthy and how we get disease when the elements are not in their usual set points. Understanding these elements can be a key to a door leading to a healthy and proper lifestyle. The Periodic Table is an organized list of elements. Everything around us is made up of chemicals. So basically we should know the importance of these elements in order for us to improve living. Learning the periodic table may not be easy but this is very applicable in every person and one's living. For a nursing student like me, the deeper explanation of elements such as their structure is worthy. The 13 basic components of the human body, their reactions to other elements or mixtures may help me discover or understand how a human body functions. Understanding the periodic table is not only essential to the study of Nursing but is also very helpful. This serves as a guide to understanding different chemicals but the periodic table also shows us the elements different properties and how to properly combine them and use them. Through the periodic table, we better understand the essential elements in our daily lives such as Carbon, Oxygen, Hydrogen, Iron, Magnesium, Calcium, Phosporus, Zinc and many more which are essential to our bodies. The periodic table helps us further understand how to chemically combine different elements and how to separate them properly. RUSSELL BERNARDINO BSTM4. Periodic table helps provide , students like me, with an invaluable tool to quickly predict an element's properties, it's atomic mass, atomic number and what group it belongs to. There are many reasons why the Periodic Table of Elements is important. The first and most important perhaps is that the elements are arranged by order of atomic number which allows scientists to clearly identify the properties of the elements. And also the periodic table organizes elements according to similar properties so you can tell the characteristics of an element just by looking at its position on the table. And as a future educator we should learn how to organize the class properly and systematically. The periodic table is the most important chemistry reference. Elements are arranged left to right and top to bottom in order of increasing atomic number. It generally coincides with increasing atomic mass. Using the data in the periodic table, students and others that are familiar with the periodic table can extract information concerning individual elements. Students also gain information from the periodic table by looking at how it is put together. By examining it, they will also be aware of the different elements and their groupings or classifications. The periodic table is a tabular arrangement of the chemical elements, ordered by their atomic number (number of protons), electron configurations, and recurring chemical properties. 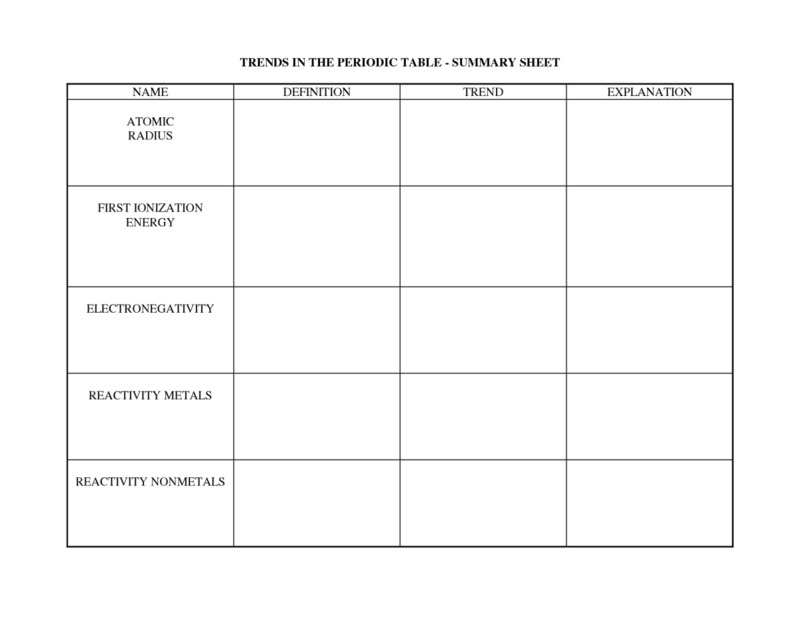 This ordering shows periodic trends, such as elements with similar behaviour in the same column. It also shows four rectangular blocks with some approximately similar chemical properties. In general, within one row (period) the elements are metals on the left, and non-metals on the right. The rows of the table are called periods; the columns are called groups. Six groups have names as well as numbers: for example, group 17 elements are the halogens; and group 18, the noble gases. The periodic table can be used to derive relationships between the properties of the elements, and predict the properties of new elements yet to be discovered or synthesized. The periodic table provides a useful framework for analyzing chemical behaviour, and is widely used in chemistry and other sciences. The first and most important perhaps is that the elements are arranged by order of atomic number which allows scientists to clearly identify the properties of the elements. Scientific researchers agree that the periodic table is a master piece of organized chemical information. The periodic table is useful because it identifies and arranges all known elements in an informative manner. Elements are arranged into periods and families. The elements in each family or period may have similar or dissimilar physical and chemical properties. The periodic table arranges the elements into families and periods (vertical and horizontal rows). The elements in each family have similar properties. ... The table tells you what elements may have similar chemical and physical properties. The periodic table describes the atomic structure of all known elements. There are many reasons why the Periodic Table of Elements is important. The first and most important perhaps is that the elements are arranged by order of atomic number which allows scientists to clearly identify the properties of the elements. Scientific researchers agree that the periodic table is a master piece of organized chemical information. The progression of the periodic table into its current form is a major achievement in and of itself with contributions from many famous chemist and scientist. The modern periodic table has changed since Mendeleev's original table, yet both the first tables and the modern table are important for the same reason: The periodic table organizes elements according to similar properties so you can tell the characteristics of an element just by looking at its position on the table. he table is useful for modern students and scientists because it helps predict the types of chemical reactions that are likely for an element. Rather than memorize facts and figures for each element, a quick glance at the table reveals a lot about the reactivity of an element, whether it is likely to conduct electricity, whether it is hard or soft, and many other characteristics. Periodic table of the elements, in chemistry, the organized array of all the chemical elements in order of increasing atomic number—i.e., the total number of protons in the atomic nucleus. When the chemical elements are thus arranged, there is a recurring pattern called the “periodic law” in their properties, in which elements in the same column (group) have similar properties. (See Figure 1.) 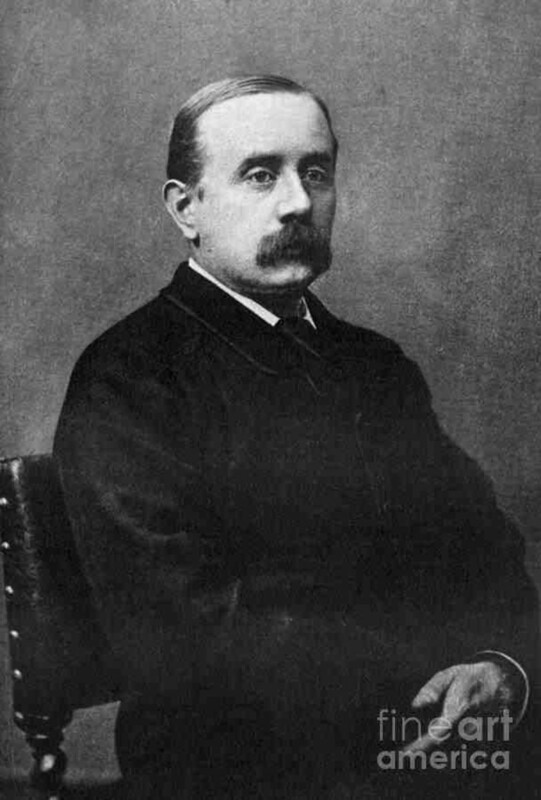 The initial discovery, which was made by Dmitry I. Mendeleyev in the mid-19th century, has been of inestimable value in the development of chemistry. It was not actually recognized until the second decade of the 20th century that the order of elements in the periodic system is that of their atomic numbers, the integers of which are equal to the positive electrical charges of the atomic nuclei expressed in electronic units. In subsequent years great progress was made in explaining the periodic law in terms of the electronic structure of atoms and molecules. This clarification has increased the value of the law, which is used as much today as it was at the beginning of the 20th century, when it expressed the only known relationship among the elements. Periodic table is the most important tool in studying chemistry. It is the heart of chemistry. 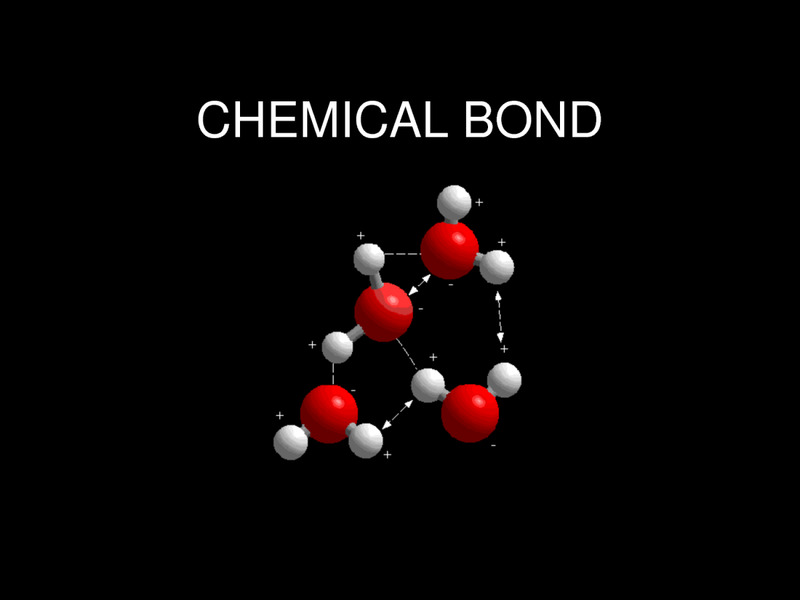 Without this, better understanding of chemistry would be impossible. or there would be no learning at all. In relation with teaching profession, The elements in the periodic table are our students. Teachers must know them well, know the capabilities of every student. because in teaching, the heart of it belongs to the students. All elements from atomic numbers 1 (hydrogen) to 118 (oganesson) have been discovered or synthesized, with the most recent additions (nihonium, moscovium, tennessine, and oganesson) being confirmed by the IUPAC on December 30, 2015: they complete the first seven rows of the periodic table. The first 94 elements exist naturally, although some are found only in trace amounts and were synthesized in laboratories before being found in nature. [n 1] Elements with atomic numbers from 95 to 118 have only been synthesized in laboratories or nuclear reactors. Synthesis of elements having higher atomic numbers is being pursued. Numerous synthetic radionuclides of naturally occurring elements have also been produced in laboratories. The Periodic Table of the Elements arranges all of the known elements in an informative array. Elements are arranged in order of increasing atomic number. Order generally coincides with increasing atomic mass. The periodic table is useful because it identifies and arranges all known elements in an informative manner. Elements are arranged into periods and families. The elements in each family or period may have similar or dissimilar physical and chemical properties. The periodic table is the most important chemistry reference there is. It arranges all the known elements in an informative array. Elements are arranged left to right and top to bottom in order of increasing atomic number. Order generally coincides with increasing atomic mass. The elements on the periodic table is so important in life today, it has helped scientist discover so many big events. The periodic table helped scientist discover what elements were needed for humans to survive. The elements also help us discover our resources and what they need. Like plants and Animals need elements to grow. Like chlorine it helps animals digest food and humans, iron helps blood carry oxygen around the body and magnesium and chlorine to help plants convert the suns energy to food. Grass contains silica that makes it very strong. So, without discovery of the elements on the periodic table people wouldn’t know how to survive, there would be no healthy foods and money would not exist in life. Periodic table of elements is the most important chemistry refence. It arranges all the known elements in an informative array. Elements are arranged left to right and top to bottom in order of increasing atomic number and coinsides with increasing atomic mass. The importance of the periodic table is that it provides a way of organizing the elements so that it's possible to make certain predictions about their chemical and physical properties based on their position in the table. With the help of periodic table, we can learn the properties of many elements at a time and classification of elements will be easier. For e.g. group 1A elements are metal, then we can figure out that all 7 elements i.e Hydrogen, Lithium, Sodium, Potassium, Rubidium, Cesium and Fracium are electro-positive in nature. The periodic table of elements is a tool that can be useful in such ways. Present in a periodic table of elements are the elements that are discovered and that exist in this world. It is important to be familiarize with that so that when there comes a time when you kind of encounter some elements, you may know a little bit of a background to that particular element. It it significant to our course due to the fact that we, researchers need to always dig on information that will be given to the people. The periodic table is the most useful tool in chemistry. The periodic table was used to predict all the element on the table. It helps us know its atomic number and its atomic weight. Periodic table is also useful in our course Tourism or in Hospitality Management because it keep us to be aware in knowing what kind of elements when we prefer to work as a housekeeper in the future. Periodic table is the most important chemistry reference. It arranges all the known elements in an informative array. 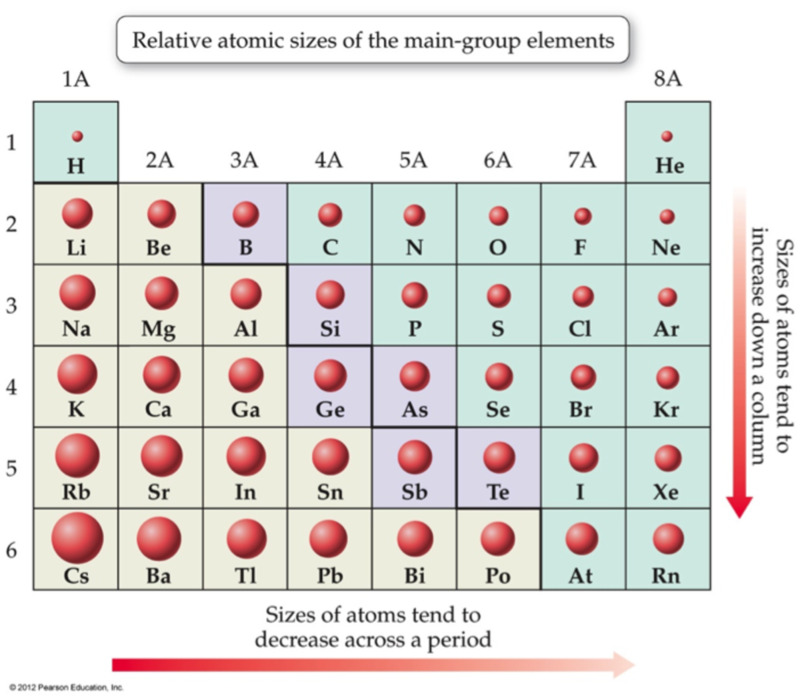 Elements are arranged left to right and top to bottom in order of increasing atomic number. Order generally coincides with increasing atomic mass. The Periodic Law states that the physical and chemical properties of the elements recur in a systematic and predictable way when the elements are arranged in order of increasing atomic number. periodic table is not about presenting the name of the element, it show the atomic no or what that element consist, and there is an division with it. periodic table is important to us to learn what element is needed in chemical like the water its consist of two hydrogen and an oxygen. The periodic table of elements is important in science because everything is made up of elements. The periodic table is organized according to trends in element properties. The periodic table provides all the information you need to balance chemical reactions at a glance. 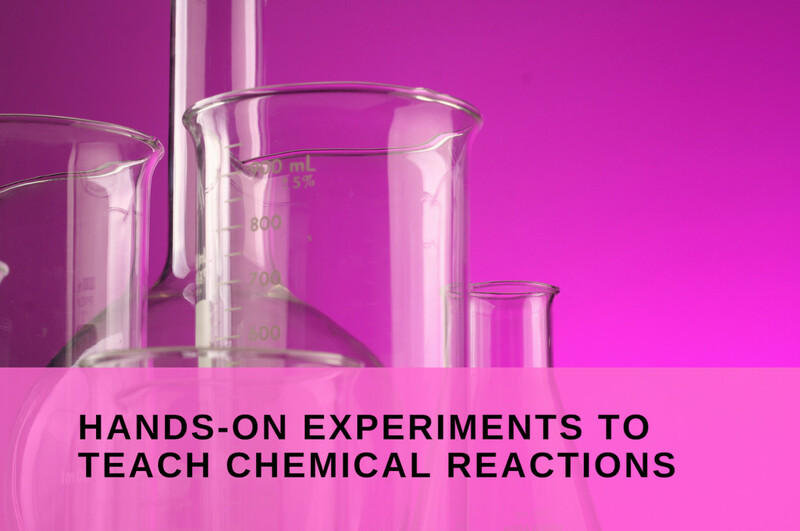 It helps us predict the types of chemical reactions that are likely for an element. We can learn the properties of many elements at a time and classification of elements will be easier. BSA 1-3 Ingalla, Rolaine Ann B. A periodic table, a listing of chemical elements arranged according to their properties, can be similar to a chart of accounts, a listing of all accounts that are accompanied by their reference number, which can help the users to easy locate a specific element or an account title. Having enough knowledge on how the elements are located to their respective position now and how it will immediately locate can help us to be time efficient and, therefore, more works to finish and more pay in return. The periodic table of the elements has gone through numerous revisions over the years as scientists have gained more knowledge about the atomic structure of the elements. The most recent version of the periodic table provides useful information that, directly or indirectly, affects everyone.The periodic table is one of the most significant achievements in science, capturing the essence not only of chemistry but also of physics and biology. It is a unique tool, enabling scientists to predict the appearance and properties of matter on Earth and in the rest of the Universe. It gives a systematic account of the early developments that led to the classification of the elements. As an accountancy student who is taking up Science subjects, the table is useful for us including the scientists because it helps predict the types of chemical reactions that are likely for an element. 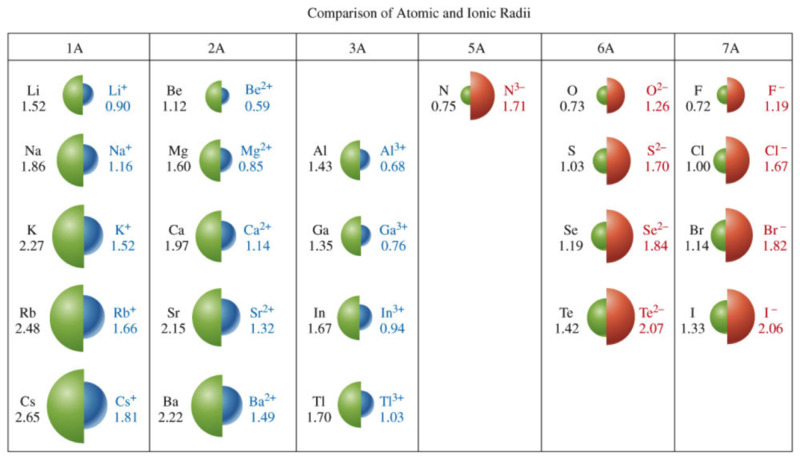 Rather than memorize facts and figures for each element, a quick glance at the table reveals a lot about the re activity of an element, whether it is likely to conduct electricity, whether it is hard or soft, and many other characteristics. Angelica G. Salinas BSBA 1-1 - The periodic table is a tabular arrangement of the chemical elements, ordered by their atomic number (number of protons in the nucleus), electron configurations, and recurring chemical properties. 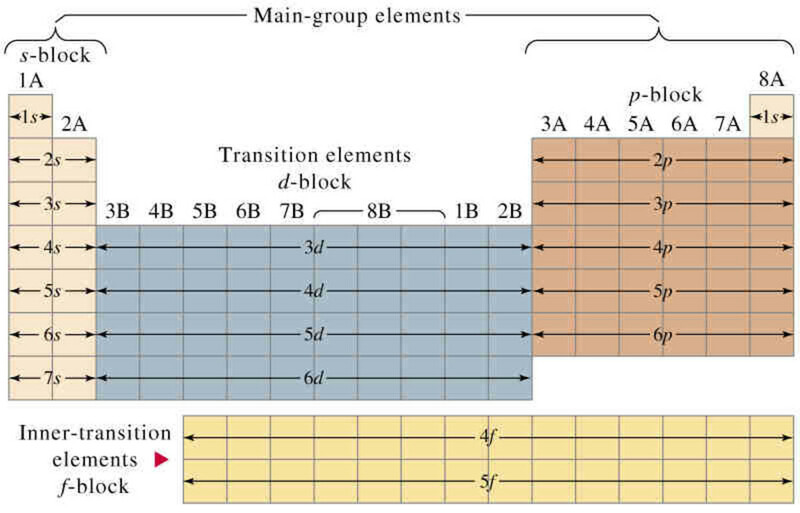 The table also shows four rectangular blocks: s-, p- d- and f-block. In general, within one row (period) the elements are metals on the lefthand side, and non-metals on the righthand side. The rows of the table are called periods; the columns are called groups. Six groups (columns) have names as well as numbers: for example, group 17 elements are the halogens; and group 18, the noble gases. 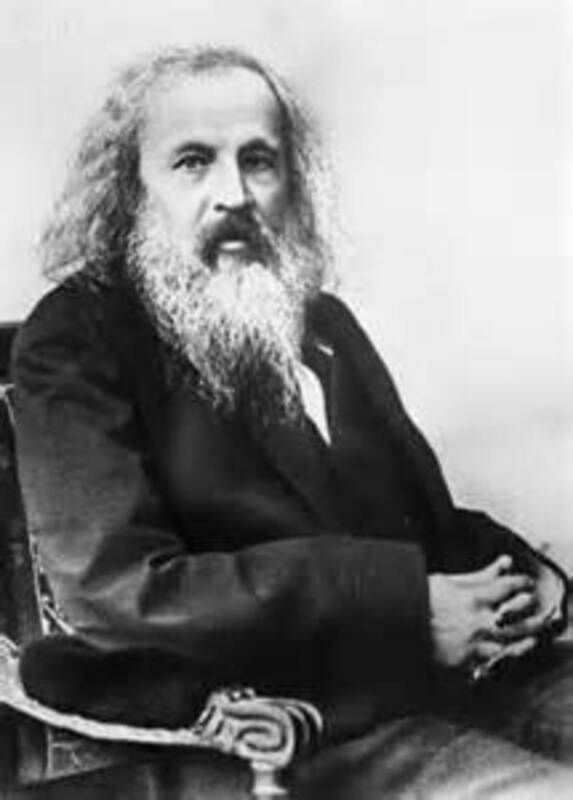 Dmitri Ivanovich Mendeleev was the one who formulated the Periodic Law, created his own version of the periodic table of elements, and used it to correct the properties of some already discovered elements and also to predict the properties of eight elements yet to be discovered. The relevance of periodic table in Hospitality Management is it keeps us aware in knowing what kind of chemical element is compatible to another chemical element that would give satisfaction for a better product. 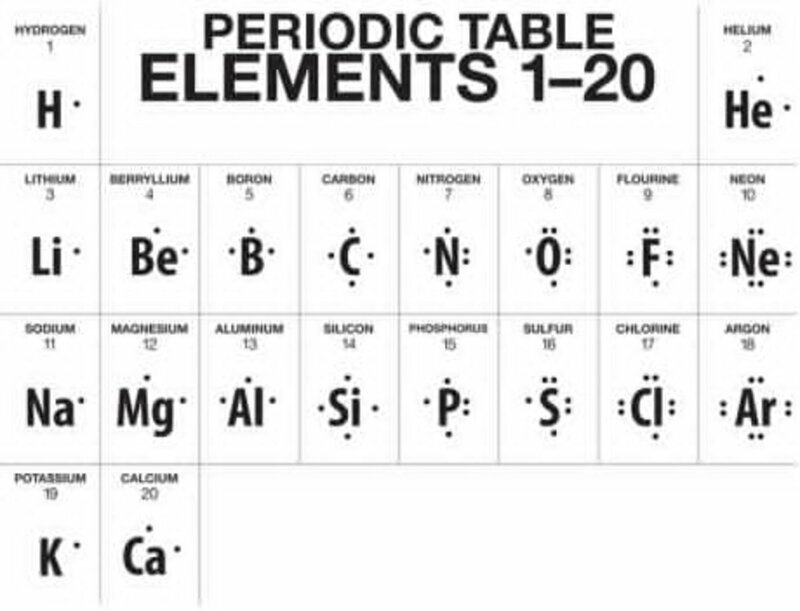 The table is useful for modern students like us because it helps predict the types of chemical reactions that are likely for an element. Rather than memorize facts and figures for each element, a quick glance at the table reveals a lot about the reactivity of an element, whether it is likely to conduct electricity, whether it is hard or soft, and many other characteristics. as a tourism student it is very important to know the elements and components of periodic table so that we can understand what use of that element and substance. Production of elements having higher atomic numbers is being pursued, with the question of how the periodic table may need to be modified to accommodate any such additions being a matter of ongoing debate. The important of periodic table is useful for modern students and scientists because it helps predict the types of chemical reactions that are likely for an element. Periodic table was a main view in chemistry. When i was high school my teacher assigned us to memorized periodic table and now it is useful in my industry because of my gen. chemistry subject. Being a TM student and an gen. chemistry student of prof liway the periodic table is important. even in high school our teacher is assigning us to memorized the periodic table and right now i think it is helpful in my subject. The importance of studying and learning about the different elements in periodic table for us is to identify what elements is being used to create a certain thing. And what element is present on the thing we may used in the future to our job. 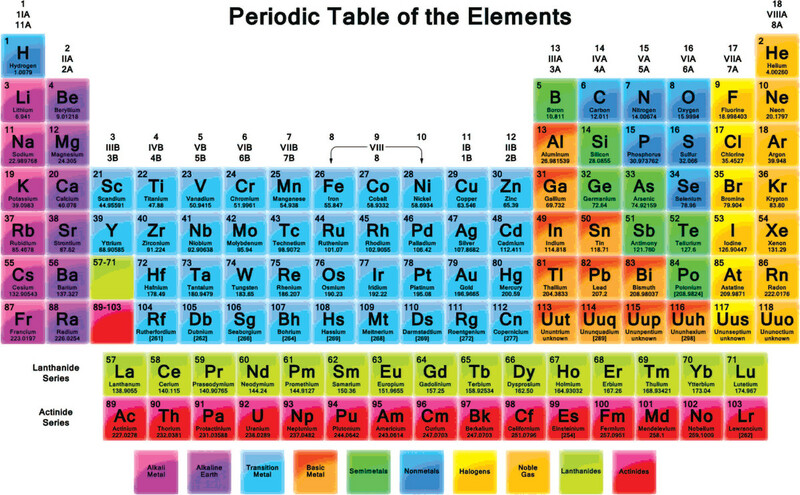 A periodic tables are important to as because they can help to us to see all of the chemical symbol,mass,units etc. Being a HM students it is very important to know the elements and components of periodic tables. as an hm student, it was very much important to know because in my industry, i need to know the different properties and substances of the chemicals we are using in cleaning specific part of the hotel . also as a cook, i need to know the different chemicals used in preparing or in making specific ingredients to make food. For HM student it is very important to know the elements and components of periodic table so that we can understand what use of that element and substance. The periodic table is useful for modern students and scientists because it helps predict the types of chemical reactions that are likely for an element. This helps us understand and know the true nature of elements that we use everyday. Many of us does not know that we use elements as part of our daily living. The relevance of Periodic Table in Hm students is a big scope for us,It's human nature to organize things. Cooks painstakingly organize their spices into various groupings, whether alphabetically or according to how often they're used. Kids dump out their piggy banks and sort their riches into piles of pe­nnies, nickels, dimes and quarters. Even the items in a grocery store are grouped a certain way. Periodic table is very important because it is our guide in chemistry. The relevance of periodic table in hospitality management is it keeps us aware in knowing what kind of chemical/element is compatible to another chemical/element that would give satisfaction for a better product. The periodic table is the most important chemistry reference there is. The periodic table is useful for modern students and scientists because it helps predict the types of chemical reactions that are likely for an element. The periodic table is the most important chemistry reference there is. It arranges all the known elements is an inforamtive array. elements are arranged left to right and top to bottom is order of increasing atomis number. Order generally coincides with increasing atomic mass. The periodic table is very important for students because it can help us on learning the basic characteristics of an element and the reactions it can create with other elements. We, Tourism students, also need to learn about the Periodic table. It is helpful to identify a particular substance once we already know something about a certain element. In our case Periodic Table was really not my type in chemistry because it has many to study with, to be honest. But I really understand how to use it and the importance of it. In tourism management it can also be applied to my course and it helped me also by knowing the elements of it. It's a must to be able to understand and how, especially, use the periodic table. To specify the kind of elements. I remember when I was in high school the first element I learn is the Ca which is Calcium, well as for the other lessons periodic table is really useful for example: How to seek the atomic orbitals and such In total, things that we use, eat and see are things which involves the elements in the periodic table. periodic table is a powerful and connect of the course because tourism management is needed of symbol nunber and names of periodic like carbon and oxygen is important of animals and palnts. about scientist is learn of cholesterol from animals and plants is phytosterol.. When I first saw the periodic table, I had learn to use the periodic table at the hard way. I wasn’t sure how much it would help me, but when i started learning it, it made me realized that the elements in periodic table have much important in my field. Periodic table is important because of it we will know the kinds of all metals, nonmetals and metalloids and also we can determine if it can harm us or not. The relevance of periodic table in our course is when we are cooking we check the ingredient if it is a liquid gas or solid. Like in periodic table we check if its metal, metalloids or non metals and the different elements of this. 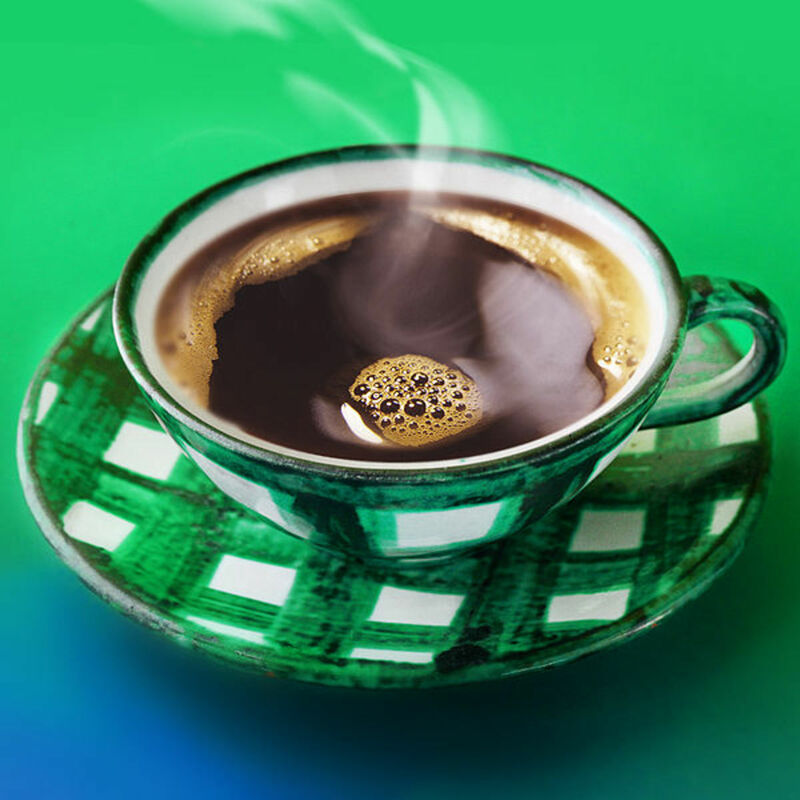 It is important for us to know because if we don’t know, we might change something to that chemical or food. The periodic table is useful for modern students and scientists because it helps predict the types of chemical reactions that are likely for an element. Rather than memorize facts and figures for each element, a quick glance at the table reveals a lot thing that you need. periodic table is the most important in science. periodic table is the most important thing in the field of science. Being a Hospitality Student, it is important fro us to know how significant the periodic table in our course. As I have my own idea, for me, it is really important for us because we should know the components of every equipment and materials we are going to use. Periodic table is used to learn about the elements; and in our course we are dealing with many kinds.